Self catered apartments with swimming pool close to Ribeira Grande, Azores north coast, 5 minutes walking to Santa Bárbara beach. Close to main roads & services. Ribeira Grande in Azores is ideal for all surfers who are looking to surf in a remote and unexplored destination. There are still plenty surf spots to explore for both beginners or experienced surfers. Azores is considered by National Geographic the second most sustainable archipelago in the world. You'll find out why from the moment you arrive. The accommodation is set on the nicest apartments you'll get close to Santa Barbara beach, located in the Island of Sao Miguel, the largest island of Azores and the one with probably more diverse surf spots. The surf school's instructors will pick you up in the morning for surf lessons in Ribeira Grande beach. Sao Miguel is the most visited island of the archipelago and known as "The Green Island". It belongs to the eastern group of islands of Azores. Ribeira Grande, is on the north side of Sao Miguel, 20 minutes from Ponta Delgada and the International Airport. This cozy Azorean coastal town is a great place for surf holidays in Azores, offering one of the best beach breaks in Azores and where ASP organizes every year a WQS event, the Prime SATA Airlines Azores Pro. You'll experience diverse breathtaking scenery awarded several distinctions, namely by National Geographic, as one of the most sustainable islands in the world, with beautiful lagoons, like Lagoa do Fogo and Lagoa Azul, impressive cliffs, volcanic sandy beaches, high mountains, green plains and crystal clear waters. Sao Miguel, like many of the other Azorean islands, is an amazing surf destination, however still remote and unexplored, as most international surfers never heard of it! One of the reasons why Azores is still a remote surf destination, is due to its location in the middle of the Atlantic Ocean, half way between the American and European Continents. Azores offers perfect waves all year round with bigger 1 to 4 meter swells in the Winter, from December to March and smaller, but perfect 1 to 1.5 meter waves, during the Summer. You will not need to surf Ribeira Grande all the time as there are plenty of empty surf spots close to the surf houses like Rabo de Peixe, Baixa da Viola, Ponta dos Moisteiros and Populo just to name a few. If you feel like hitting the roads of Sao Miguel with our surf guides, then the surfari packages will be your preferred option. Surfari package in Azores are more suitable for those surfers with experience or intermediate level. In Sao Miguel there is a great diversity of surf spots, from easy beach breaks to fast waves producing thick barrels with 2 - 3 meters with difficult access. For the beginners we recommend staying at the surf camp, with surf lessons included on the pack, held by certified local surf monitors that will take you to an easy beach breaks. Every morning the surf school instructor will pick you up at the apartments to take you to the most appropriate surf spot on that day. Accommodation located in a strategic location to have quick and easy access to most of the surf spots and essentially to Ribeira Grande beach, the most consistent surf spot in the island and home to the ASP Azores Pro. The archipelago of Azores is also a paradise for outdoor activities including whale watching, swimming with dolphins, walking and trekking, diving, fishing, safaris, bird watching, sailing, snorkeling and many others. Let us know if you want to go on some of these extra activities. We will be happy to arrange it for you! These apartments have a swimming pool and a beautiful garden area where you can chill out with friends, other guests and surfers after another epic surf session in one of Sao Miguel's empty surf spots. For real! The accommodation is surrounded by nature. In fact pretty much everything in Azores is surrounded by nature. Wherever you go in Ribeira Grande, Ponta Delgada and other cities of Sao Miguel, you will be in total contact with nature, which, combined with the surf atmosphere will make it the perfect combination for your surf holidays in Azores. Ribeira Grande is the ideal location for those looking to surf in Sao Miguel, but that also that want to enjoy the Azores in all its essence; not only for surfers but for all nature lovers. These "4 star" apartments are located in Ribeira Grande and equipped with a special thermal insulation and air conditioning, telephone and television. Each apartment has one or two bedrooms (hosting up to 4 persons), private bathroom, fully equipped kitchenette and include daily cleaning. One of the apartments is fully prepared to receive people with low mobility or disabled. Ribeira Grande Surf Apartments has also has a reception and play room with bar and pool table, Internet access, free parking, children playground and a pleasant swimming pool surrounded by flowers. The surf camp pack, surfari and self-catering packages do not include breakfast or any other meals, but these meals can be provided for an extra cost and served at the nearby restaurant. 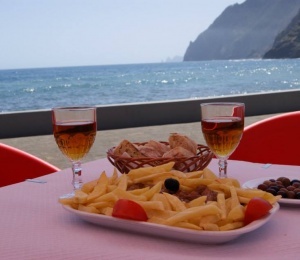 All kind of dishes can be prepared, but we definitely recommend going for the traditional Azorean gastronomy. The Azores is located 1.300 km off the coast of Lisbon and in the path of the Atlantic swell caused by storms that produce consistent and powerful waves all year round. Because of its location, half way between the American and European continents, Azores is blessed by swell from all directions, even during the summer months, when Europe surf spots offer less waves. The 360 degree swell exposure of Azores allows almost any wind and swell combination. How perfect could it be? This is one of the reasons why the Association of Surf Professionals (ASP) organizes a Prime surf event in Sao Miguel island, usually in September just before the WCT championship starts in Hossegor and Peniche. Despite the ASP Azores Pro, the archipelago still remains surprisingly crowd free, a dream for any experienced surfer. Being quite remote islands, the surf spots in Azores managed to keep its secrecy and wilderness. During the Winter months, Azores receives some of the biggest waves in the Atlantic when powerful northern swells reach the shore. Azores can be the real paradise for big surf riders and experienced surfers. Nevertheless, there are beach breaks more protected from the swell like Rabo de Peixe, that are very good for beginners during the winter. During the Spring and Autumn the swell changes and offers better conditions to intermediate surfers but still with consistent swells. In the summer months you will still be able to surf decent waves but with smaller size. The predominant surf breaks are thick, heavy, reefs and point breaks. Although, some good quality beach breaks, ideal for surf learning, can be found as well, namely Ribeira Grande. The weather in Azores is highly influenced by the Atlantic Ocean, its currents and tropical storms, but overall it is considered mild, not offering major differences all year round. During the Winter, the average temperature is 13 C, and Summer around 22 C. The ocean temperatures range from 17 to 22 C degrees and the water is crystal clear. We recommend you to bring some surf gear with you, as there are not many surf shops in Sao Miguel or in the whole Azores Archipelago. So just in case, bring surf equipment that suits you the most and according the swell conditions. In terms of wetsuits, probably the most recommendable option would be a 3.2. If you are taking the surf camp package that includes surf lessons, so you do not need to worry about equipment as it will be provided. SURFINN © 20-04-2019 04:54:52. ALL RIGHTS RESERVED.